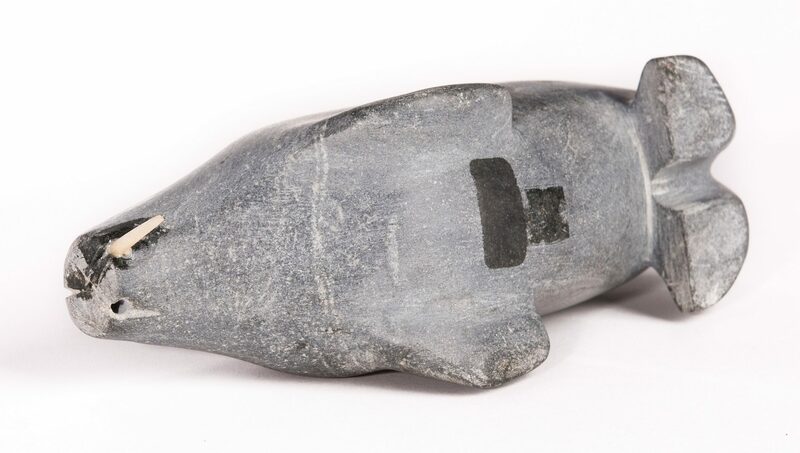 1st item: Johnny Pootoogook wolf carving. Signed and dated "Dec '04", underside of base. 2 7/8" H. 2nd item: S. J. General turtle carving. Signed, underside of carving. 1" H. 3rd item: Mary Utye swan carving. Signed and dated "MU/79", underside of carving. 3 1/4" H. 4th item: Bear carving, attributed Tony Totan. Signed and dated "T Totan 91", underside of carving. 1 3/4" H. 5th item: Bison carving. Signed and dated "L R 95", underside of carving. 3 1/4" H. 6th item: Musk ox carving. Signed "KK", underside of carving. 2 1/2" H. 7th item: Owl carving. Illegibly signed with "Eskimo Art Esquimau" sticker, underside of carving. 5 1/4" H . 8th item: Walrus carving. Signed, dated, and numbered "Lappotc 2002 96616", underside of carving. 3 5/8" H. 9th item: Bird carving with attached wooden peg on base with single egg. Unsigned. 4 5/8" H. 10th item: Bird carving. Numbered "1483", underside of carving. 1 1/4" H. 11th item: Seal carving with base. Illegibly signed, underside of base. 2 5/8" H. 12th item: Walrus carving. Unsigned. 3 1/8" H. 13th item: Bird carving with outstretched wings. Unsigned. 3 1/2" H x 11 1/2" W. 14th-15th items: Two bird carvings. Unsigned. 2 3/4" H to 3" H. All items late 20th century/early 21st century. CONDITION: 5th item: One tusk broken, one tusk missing. 9th item: Break to beak. 12th item: One tusk missing, walrus carving. Areas of tape/sticker residue, largest 1 3/8", surface and underside of walrus carving. 13th item: Repairs, 1 5/8" H x 1 1/2" W area on right wing tip, 1 1/2" H x 3/4" W area on right leg. 14th-15th items: 5/8" break, tail feather of 3" H carving. Other items in good condition.